Freshman guard Presley Brown scored a career-high 34 points, leading the LaRue County Lady Hawks past homestanding Thomas Nelson, 77-58 on Thursday. Brown also had six steals, five rebounds and five assists for LaRue County (8-11), while junior guard Delany Eastridge scored 17. Senior forward Alyson Yingling added 10 points, 11 rebounds and four steals, and freshman guard Mallory Williams had nine points, seven assists and four steals. The Lady Hawks, who shot 43 percent from the field, led 26-9 after the first quarter. Retired U.S. Sen. Wendell Hampton Ford, the self-styled "Boy from Yellow Creek" who became governor of Kentucky and assistant majority leader of the U.S. Senate in a 33-year political career, died early Thursday, Jan. 22, 2015. Ford had announced on July 18, 2014, that he was battling lung cancer. 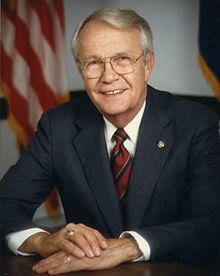 Ford, who never lost a race, served in public office from 1965 to 1999 - first as a member of the Kentucky Senate, then as lieutenant governor, governor and U.S. senator. A Marion County man was killed after he became trapped in a grain bin at 911 Merrimac Road in Bradfordsville around 3:40 p.m. Wednesday. Joseph Gary Blanford, 64, of Holy Cross, had climbed into the bin to attempt to unclog the auger when the soybeans caved in on top of him, causing him to be buried in the soybeans, according to a press release from the Taylor County Sheriff’s Office. Blanford was pronounced dead by Taylor County Coroner Terry Dabney at the scene. Dabney said Blanford died as a result of asphyxia. After being charged with murder for the deaths of an Elizabethtown couple following a wreck in August 2013, a Hodgenville man accepted a plea deal just moments before jury selection was to begin. Earl Dale Richardson, 47, pleaded guilty Wednesday morning to reduced charges of reckless homicide, one count for each of the two victims Johnie and Luevenia Dennis, in Hardin Circuit Court. The recommended sentence was a total of 15 years. The LaRue County Hawks fell 67-32 Jan. 20 to the visiting Barren County Trojans. The Trojans (14-6) blitzed the Hawks (10-6) in the first half, outscoring them 44-17 and winning for the 10th time in 13 games. Senior guard Micah Wiseman paced LaRue County with 12 points, while senior forward Caleb Sheffer added 10 points, seven rebounds, three assists and two steals. Sophomore guard Cameron Dawson scored seven for the Hawks, who had won seven straight. Where Opportunity Knox is bringing its breakfast program, “Veterans: A Workforce and Talent Solution,” to Hardin County, providing tools and insights to help companies of all sizes hire veterans. The Boyhood Home Unit at Knob Creek, part of the Abraham Lincoln Birthplace National Historical Park is now closed due to construction. For more information, visit www.nps.gov/abli. Brandon Carroll (1983) failed to appear Dec. 15 in LaRue Circuit Court. A bench warrant was issued with bond to be applied to financial conditions. According to court records, he owes $210. Scott C. Ferguson Jr. (1984) was sentenced to three years Dec. 15 in LaRue Circuit Court on a count of trafficking in controlled substance within 1,000 feet of a school, and trafficking in controlled substance less than 2 grams (methamphetamine). He was fined $185. Probation was denied. Snow began falling about 8 a.m. Thursday in LaRue County, making road conditions treacherous in some areas. Slick roads may have been a factor in a two-vehicle collision that occurred about 8:24 a.m. at the intersection of U.S. 31-E (Bardstown Road) and Ky. 84 (Howardstown) in White City.